Flipping through WOOD Magazine, a simple column ad layout caught my eye. The ad said “TUB O’ TOUGH” and the full background was yellow. The main visual was a large cylinder ‘TUB’ of towels. I thought to myself, “well, that’s cheesy.” But because of the ad’s simplicity and undertones of a construction feel, I was intrigued to find out more. With a quick search I found out that these are heavy-duty wipes and have a pretty hefty claim—taking off anything from adhesives to lipstick, tree sap to permanent marker. 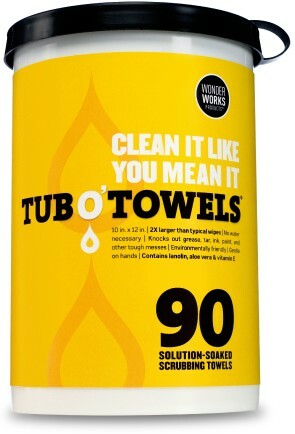 The website gloats a bigger (10 inches by 12 inches), tougher (muscle-weaved) and soaked with a knock-your-socks-off cleaning solution. I guess these aren’t for cleaning your kids’ diaper messes. If I heard these claims and saw the previous package design, I might have laughed. But with the new design, it makes me think these are all plausible. The aesthetics of the package make the brand claims believable, while the use of clever slogans and advertising makes me want to try them. Whatever I’ll be cleaning, I’ll be sure not to call them a wipe.